Don't you just love Fall??? October has somehow become the beginning of the holidays for us. It has to do with a little festival called Arkalalah. Every year we go to this hometown extravaganza of food, parades, more food, more parades, a carnival and one little thing called THE FUN RUN. The carnival is a blast, too! Lou, Lou is a daredevil extraordinaire like her Dad. 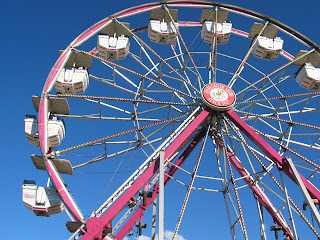 Me, I have a "healthy" fear of heights and a wicked equilibrium problem that prohibits me from riding the Tilt-a-Whirl without serious consequences. (I got the "no spinnie, spinnie gene from my Dad, too. I vividly remember the green tint to his face as he exited the ride and proceeded quickly to the bathroom when we went to "Joyland" when I was a kid.) This aversion actually works out well now because we have little ones but will not work out so well when they are all of "riding age" and don't want to ride alone. 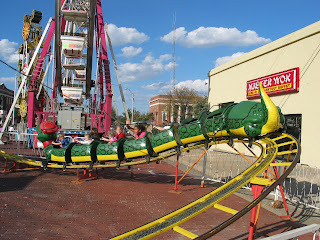 KID: "Mom, will you take me on that ride?" ME: "Ummm, I have to go to the bathroom, go ask your Dad." 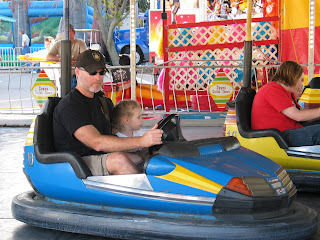 Seriously, it is bad when you would rather use a carnival port-a-potty than ride a ride with your kid. My healthy need not to die is pretty strong. You know, I'm a self-preservationist. SAVE THE MOMMY!!!! Another thing I love about fall is visiting the pumpkin patch. Then the fun of pumpkin carving begins. It is quite an event at our house. We can't do the stereotypical Jack o' lantern face...that would be WAY too easy. Lou, Lou always request a cat on her pumpkin. Cats are her favorite and anytime there is a choice of animals...the answer will always be cats. She even spent about a month being a cat when she was little. Everything was "Meow" this and "Meow" that. Fortunately, I am fluent in Little Girl Kitty language. I love dressing up the front of the house in its fall finery. It is so festive and nice. Doc on the other hand... dresses up in "finery" of his own. It is also festive but not exactly "nice". Interesting, funny, cheesy, even delightful but not so much nice. And that is why I like Fall. The End. Too cute! I love pumpkin carving. 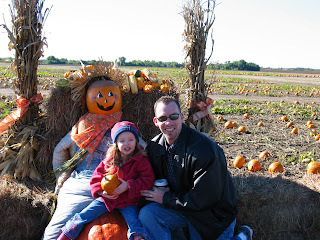 Or to be more specific, I love to watch my husband carve pumpkins with our children. That has been his thing since our first child was a baby. They seriously get into it, planning what to carve, picking the "just right" pumpkin, etc. Unfortunately, this is our last pumpkin-carving year with our children. Our younger child will graduate from high school this year and is kind-hearted enough to carve one last pumpkin with Daddy. My husband is already planning pumpkin-carving events with the (hopefully far, far in the future!) grandchildren! Silly, but true! Oh, I forgot to mention... my daughter does the "kitty talk" thing to. When she is hungry, she will look at me, her eyes big as saucers, and say, "Me-ow!" The louder she meows, the hungrier she is. Total silliness, but very "her!" Lovely post full of the fun things that go with autumn. It is my favorite season and although i have moved a million miles away to the tropics it still feels lik indian summer to me.